According to the national institute of health they say the people that are the most sleep deprived are us of course, the college students. “Research at Brown University has found that approximately 11% of students report good sleep, while 73% report sleep problems. ” On average adults should get around eight to ten hours, but do most college students succeed with that…not really. Instead we tend to get 6, maybe even less due to things like sports, work, and studying. 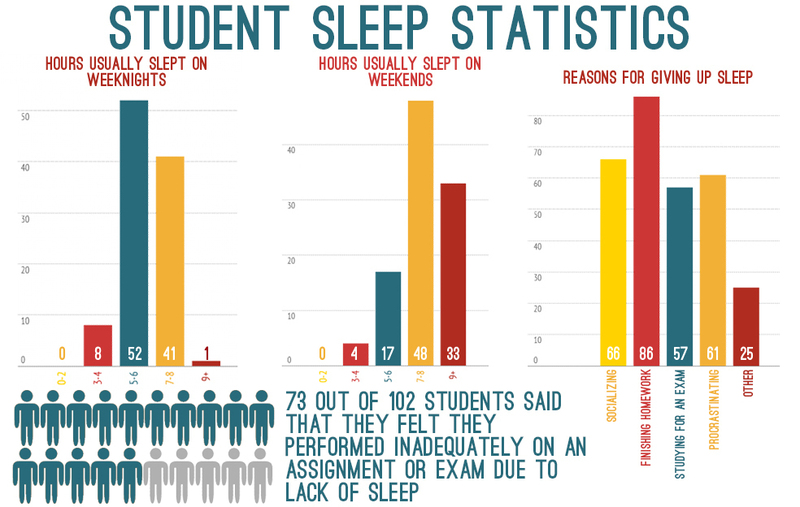 These statistics don’t really surprise me as much, because we’re trying to balance out sleep between school and social time. Its very hard to get all three things perfect. I wonder what nights college students had the most sleep issues, in the beginning, middle, or towards the end. Would that change the statistics about the number of hours and the sleep problems. Our appearance looks different as well when us college kids don’t get enough beauty sleep. There was this one study done by researcher Tina Sundelin, M.SC who did a correlation study that dealt with participants looking at pictures. There were 40 participants altogether and they had to look at 20 photos. Ten of the photos were of people that had slept for more than required 8 hours of sleep. The other set was of people that didn’t sleep at all during the 24 hour cycle. After looking at the photos they had to describe the folks in the picture. The participants said the ones who got no sleep had bags under their eyes, skin almost like a ghost, ect. One of things I wish they mentioned was the categories for the twenty photos. Was it a mix of kids from freshman to Senior year the participants looked at in the photos or were they all from one class. From now on I will try to make an effort to making a habit of going to bed at an earlier time. Also I need to stop doing homework till the very last minute. That’s one of the reasons I stay up too late. This entry was posted in Uncategorized on October 22, 2015 by Stacy E Smerbeck. I have a terrible sleeping pattern that seemed to start ever since I got to school. I can’t even really blame studying for it either I just can’t sleep before one o’clock. It makes me sleep in and debate missing my 9 am every time. I don’t get energy until about 7 at night. Another thing I think it effects is my appetite. I can’t eat at normal hours nor as much as usual. Maybe I should try sleeping less. An interesting article could be one about how to fix a sleep schedule. This post is extremely relevant. I find it interesting that so many college students pull all nighters. Personally, I have not found the value in doing so. I did it once and felt absolutely terrible. I could not focus the next day, got sick and felt stressed an anxious. I would much rather a smaller amount of quality time to study than a lot of time studying while I feel exhausted. I believe that the cons of pulling an all nighter far out way the pros. This topic is extremely interesting to me because I have my fair share of all nighters or at least very late nighters. Whenever I am up very late, I cannot help but think of if I am hurting my body or not. I knew a lack of sleep could make you feel worse, but i was not sure that it could actually make you sick. I am now most definitely going to try and go to bed at a reasonable time by getting my work done early and not drinking as much caffeine. I love this topic because it is so relevant to many of us here at Penn State and it is extremely important to learn more about it. 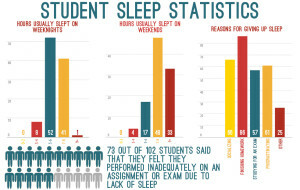 I would really like to know how a lack of sleep affects a student’s grades so I might even blog about that! This is a very relevant topic. I know the majority of college students spend their nights into the early morning doing assignments and studying for exams. I wonder if the cause behind the all-nighters is a heavy workload, procrastination, or a combination of the two. It is difficult to manage time wisely between school and social life, and sleep is also impacted because of this. Nice article, I am someone that will not ever pull an all-nighter to study or do homework. I will stay up late and do work if I need to but I have to at least get some sleep. At a certain point of the night, my marginal rate of return for work that I’m able to get done starts to really drop. I’ll be less and less efficient with getting things done from this point on that if I can wait to do this work later it is really not worth staying up for. I’ll be even more tired the next day and that will effect how productive and efficient I am on that day too. When it comes to studying for an exam, once I am clearly too tired, it becomes almost pointless to keep going because I won’t get much done, and again the confounding problem of being too tired during the exam as well. Your article backs up what I previously thought, sleep is important and some sleep is better than no sleep.